This is where it all started for Shake Shack. It went from a humble hot dog cart to a multi-million food chain in just a few years. It was created by the Union Square Hospitality Group in 2001 in support of the Madison Square Park Conservancy. It was a great success right from the outset, as people used to queue for their hot dogs. This led to it becoming a permanent food kiosk in the park in 2004 with full permission from the authorities. The business grew from there. The actual building was designed to be harmonious to its park surroundings. Location? Southeast corner of Madison Square Park near Madison Ave. and E.23rd St.
Price level (only burger): A Shack burger (cheeseburger) with lettuce, tomato and Shacksauce is $4.55 (£2.90) and $7.10 (£4.55) for a double. Price level (burger+chips & drink): Standard burger + chips and soft drink cost $9.00 (£5.85). Their burgers are all made from freshly ground 100% Angus beef with no hormones and antibiotics. Flat topped hot dogs, fries and shakes. Double Stack (Same, but with a cheeseburger added). For vegetarians: a ‘Shroom Burger (crisp-fried Portobello mushroom with Muenster and cheddar cheese, lettuce, tomatoes and Shack sauce). That depends on the time of year and the queues, but usually within 1 hour. Unless you go during the most busy time, weekend afternoons. Daily menu of frozen custard. You got a dog? 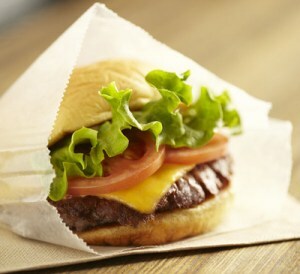 Well, Shake Shack also have a line of Shack burgers aka. dog biscuits for sale. No, Shake Shack don’t offer delivery. They don’t need too. If Shake Shack is too busy or you simply want to try another cheap restaurant in NY, try Whitmans burgers or Grimaldi if you’re into pizza.